The Queen of Wands represents the passive characteristics of Wands and fire, just as the Knight of Wands represents the active characteristics of the suit. The Queens correspond to Binah, and are the Water of Fire. 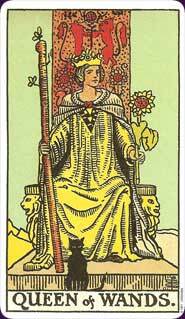 The Queen of Wands, then, is a proud, adaptable (where Water meets drive), persistent, generous, and calmly inspiring. While the Knight exemplifies Strength and Dominion, the Queen exemplifies Virtue (which also corresponds to Binah, like the Queen). She passively exudes the qualities of the suit of Wands. She can also be intimidating, snobbish, savage, and convinced of her own right(eous)ness (arrogant). She may sometimes be nurturing, but can also be cruel and tyrannical, and may sometimes be disconnected from those she rules. She is quick to anger, and enjoys being in control, and if she loses her authority, her calm facade can slip away. The Rider-Waite image shows the queen sitting on a throne, looking noble and rather proud, calmly waiting for an audience. The Thoth illustration shows a rather imposing and calm figure, the sun shining out of her head, looking down upon her subjects. Both images show a cat, which is the animalistic equivalent of the Queen of Wands; aloof, calm, proud, and ruler of her own private kingdom. In a reading, this card advises you to look for the influences of a calm, authoritative personality, who can both be inspiring and intimidating. This person leads not with active charisma as the Knight of Wands does, but by example, keeping the moral standard high. She may think she’s above everyone else, and may oftentimes be tyrannical and arrogant, but at the same time she can also be generous, compassionate, and adaptable. Reversed, this card’s energies are blocked or hidden in a person; look for these traits showing where you may not expect them, or how they manifest in unique ways.